There are sixteen traditional categories of judgement in The World Beard and Moustache Championships, arranged in three groups – Moustaches, Partial Beards, and Full Beards. A seventeenth category, the Alaskan Whaler, was added in the 2009 Championships held in Anchorage. For more information, The Beard Team USA Blog has traditionally presented pre- and post-game analyses of the categories, and current standings are presented on the Results/Rankings page of this website. Slender with the tips curled upward. Hairs growing from beyond the corner of the mouth must be shaved. The tips may not extend above the level of the eyebrows. Styling aids* permitted. Slender. The hairs extend outward from the middle of the upper lip. The tips may be slightly raised. Hairs growing from beyond the corner of the mouth must be shaved. Styling aids* permitted. Small and bushy with the tips curled upward. Hairs growing from beyond the corner of the mouth must be shaved. Styling aids* permitted. Big and bushy. The hair extends outward from the middle of the upper lip. All hair growing from more than 1.5 cm past the past the corner of the mouth must be shaved. Styling aids* permitted. Free design and styling of the moustache. All moustaches not meeting the criteria for other categories may compete in this category. All hair growing from more than 1.5 cm past the corner of the mouth must be shaved. Styling aids* permitted. The goatee appears as it grows naturally. The more natural the better! The goatee and moustache may be maintained but without any styling aids. * The moustache may not be curled. An area at least 4 cm wide (the width of a razor blade) between the temple and the goatee must be clean shaven. The beard is narrow and pointed. The moustache is slender, long, and drawn out in a slight bow. The moustache may not include hairs growing from more than 1.5 cm past the corners of the mouth. All areas more than 2cm past the corner of the mouth must be clean shaven, as must all areas under the chin. The tips of the moustache extend downward. The Genghis Khan moustache style is also acceptable. 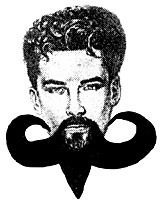 Free design and styling of the goatee. All goatees not meeting the criteria for other categories may compete in this category. An area at least 4 cm wide (the width of a razor blade) between the temple and the goatee must be clean shaven. Hair on the cheeks and upper lip. There must be clean shaven spaces of at least 4 cm wide (the width of a razor blade) on the chin and between the facial hair and the onset of the head hair. The whiskers are styled upwards. No closed curls. The hairs on the upper lip may not be separated from the hairs on the cheeks. The hairs may not be too long, not above the level of the eyes. Free design and styling of all partial beards that are not goatees. Such partial beards not meeting the criteria for other categories may compete in this category. An area at least 4 cm wide (the width of a razor blade) between the temple and the goatee must be clean shaven. Areas at least 4 cm wide (the width of a razor blade) on the chin and between the temple and the goatee must be clean shaven. The Sideburns category was introduced for the Carson City worlds in 2003 to honor the King, Elvis Presley. The category has remained controversial since its inception. The Association of German Beard Clubs translates the name of this category into English as “Whiskers ‘Freestyle’ & ‘Sideburns’,” but the German description excludes sideburns, a term not used in German and a facial hair style not common in Germany. The beard appears as it grows naturally. The more natural the better! The moustache may not be highlighted. The beard may not be curled under at the bottom! The moustache is distinct from the beard but may not include hair growing from more than 1.5 cm past the corner of the mouth. The moustache may be styled as in the Dali, English, Hungarian, and Imperial moustache categories. The beard appears as it grows and left natural. The more natural the better! Styling aids* are permitted on the moustache. No styling aids*are permitted on the beard. Full beard, short and rounded at bottom, no more than 10 cm in length as measured from the bottom of the lower lip. The moustache is distinct from the beard but may not include hair growing from more than 1.5 cm past the corner of the mouth. The beard is wide and rounded at the bottom, and no more than 20 cm in length as measured from the bottom of the lower lip. The beard appears as it grows naturally. The more natural the better. The moustache may not be made distinct from the beard or styled. The beard may not be curled under at the bottom. Free design and styling of the beard. All full beards not meeting the criteria for other categories may compete in this category.